Be the first to share your favorite memory, photo or story of Scott . This memorial page is dedicated for family, friends and future generations to celebrate the life of their loved one. 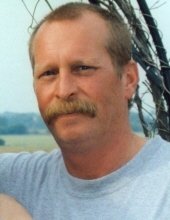 Gone too soon, Scott T. Rowland, 55, of Lynn Center, IL, a wonderful husband, father, son, brother, and brother-in-law passed away on July 17th, 2016 at home. Scott was born in Moline, IL on December 30, 1960 to Dorothy and Orlin Rowland. He married Carolyn Hawk on March 20th 1983. Scott worked at Sexton Ford for more than 30 years. He later worked for Gary and Joe Kness, Clover Township and most recently, the Village of Alpha. Scott embraced simplicity and was well known for his quick and very dry wit. He enjoyed motorcycling, taking drives in his old Chevy pickup, spending time in Wisconsin and time with friends and family. He believed in giving back to his community and volunteered with the Oxford Fire Department, where he was a first responder and the training officer for many years. Scott will be lovingly remembered and forever missed by his wife, Carolyn, son, Ryan (Nikki Edwards), Middletown, DE, sister, Monica (Dave) Flowers, Aledo, brothers, Darrell (Kim), Sherrard, and Kenny (Annette), New Windsor, sister-in-law, Teresa Edmund, Cambridge, brother in-laws, Michael Hawk (Judy Kellerman), Dubois, IL and Aaron (Penny) Hawk, Pinckneyville, IL, and numerous nieces and nephews. His family would like to extend a heartfelt thank-you to all friends, the medical teams at Unity Point and Loyola University Medical Center, and family who have offered their support and love throughout his illness. A special thanks to the nurses from Unity Point Hospice: Kristine, Jen, Brenda, Tori, and Amanda. Scott greatly appreciated each and every one of you. Per Scott’s wishes, cremation was accorded and family and friends will celebrate a life well-lived on July 23rd, 2016 at the Alpha Legion, Alpha IL, from 2-4. Scott was preceded in death by his mother Dorothy, father Orlin, brother Mike, and sister Lisa. Memorials may be made to the Oxford Fire Department, or the Alpha Legion. To plant a tree in memory of Scott Rowland, please visit our Tribute Store. "Email Address" would like to share the life celebration of Scott Rowland. Click on the "link" to go to share a favorite memory or leave a condolence message for the family.